On the 21st January 2015 I wrote a tutorial about how to create a custom Thank you page in WooCommerce. The article had and is still having a huge success (huge compared to the other articles on this blog). I received a lot of comments on it, and from the first version, I improved the script a lot following your feedbacks. A week ago I decided to make your life easier so I wrote a new plugin for it, you will not need to add custom code anymore! Be sure to meet the following requirements before to use the plugin. Click on Install Now to install the plugin. Using this plugin is easy and fast.Just activate it, then go to WooCommerce > Settings > Checkout and find the new option Thank You page. Choose there the page you want to use as your custom Thank You page. The customer will be automagically redirected there as soon as they complete a purchase on your store. Sure! You can contribute by reporting issues or working on the code in this repository on GitHub, or by translating the plugin in your language and submitting the translated files via email from the Contact page (there’s not a file field, so please upload them somewhere and send me the link to the file, like on Dropbox or Google Drive). Great, thank you! I’ve just installed it, deleted the previous added code in functions.php, as well as the folder “custom-thank-you” that I uploaded to my ftp. but how can I customize (content & style) the thank you page now? ah, I found it – in the folder “templates”. but I guess it wont be update safe to make any changes there, right? Are there any advantages/disadvantages of using your code as plugin instead of pasting the code in functions.php? many thanks in advance! you can override templates in wp-content/themes/your-theme/woocommerce/thankyou/. That way it will be update safe. The advantages are that you don’t need to know anything about coding and you don’t have to do any change to your theme unless you want to further customize the templates. Just have to say how greatful I am thanks to you. Most people make you pay for these types of plugins but you sir are a life-saver! I usually don’t comment on blog comments (infact never have I ever) since im so lazy or just don’t care, but this time I just had to say thank you, thank you, thank you! is it possible delete the order details from the thank you page? Thank you so much for you job! It includes the template thankyou/table.php in the Thank You page. By removing it you will completely remove the products table. There are other hooks you can remove as well if you want. I have added this action to my functions.php but it’s not working. I am not able to remove the order details from the thank you page. I also tried to change it using the checkout/thankyou.php in woocommerce templates, but it seems that it’s not coming from there? First of all thanks for the really greatest plugin. It’s working very fine. But do you know how I can translate the items into dutch? you will find the POT in the folder /languages of the plugin. You can translate it in Dutch. If you want to translate it easily, just install the plugin “Loco Translate” (free on wordpress.org) and read its documentation to know how to use it to translate other plugins. I used the first part of your code to make a custom thank you page. I need to add the order details now and would like to use your plugin to do that. What i am unsure about is how do i use your plugin and get the order details + also have the customised elements that i have on my custom thank you page? yes it’s possible. The templates in the plugin are customizable. Just copy them in your theme, inside the folder woocommerce/checkout/thankyou/ and then edit them as you need. Remember to remove the code from the old tutorial from your functions.php file. Great plugin, thank you for your work! One question please, is it WPML (WordPress Multi Language) compatible please? I’m not sure if it is compatible, I never tested it with WPML, sorry. I just installed your plugin and chose a new page to be redirected to but missing the order-details – how can I integrate them? Thank you so much for the plugin it is fantastic. I have a question about how to align the tables and text to the centre of the page as they are all showing up to the left of the page as below and I would like then to be in the middle of the page. The issue with your checkout page is probably due to your theme that is not 100% compatible with WooCommerce. It seems to me that it’s missing some HTML in the layout, and that causes the table to be aligned wrongly. I’d try to use a different theme to confirm the conflict. If it works on a different theme, you’ll want to contact the theme author and ask them to fix the bug. But it is not working. How can I deleted the order details from the custom page? Instead of using $this in the code use wc_custom_thankyou(). $this does not exist in your functions.php file because it can be used only inside the class code. But do you have a plugin that can specify a different page for a different product? I sell different products and services and I need my thank you page to reflect what the customer has recently purchased. That way I can try and up sell them. I’m sorry but no, I don’t have a plugin for each specific product. I just went through implementing this. I so appreciate your work in creating this plugin. I just tested it on WooCommerce 2.6.2 and WordPress 4.5.3 and it works perfectly! Hi Nicola, I just happened to get a call to take an order from a new customer online. 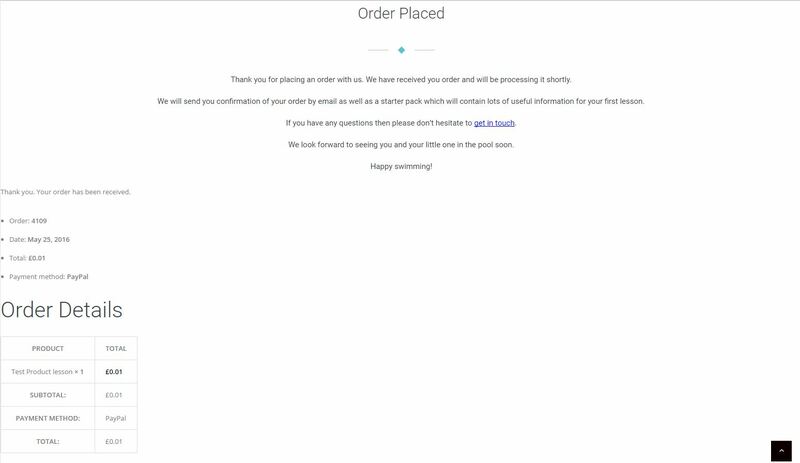 I went to the shop page, cart, checkout, completed the order, but the thank you page only showed the text I had entered and none of the order information. This is something new, not sure what’s causing it. Any thoughts let me know, in the meantime I’ll investigate further and see if its’ related to some other plugin or the latest WordPress update? Just wanted to take a second to say thank you very much! the plugin is exactly what I was after and still retains all the order information on my custom page as I’d hoped! Anywhere to make a personal donation to you? If you want to help, subscribe to the newsletter if you haven’t yet and share the blog with your friends! I’d be very happy with that. Thank you so much again, I really appreciate it. Is it possible to add the order notes to the thank you page as well in the customer details? Will this plugin break my tracking pixel for FB and analytics? Really want custom thank you pages but don’t want the tracking to break. @nicolamustone, realized that you asked for that in the forum, not sure if this works here or not, hope you see this! Hey Shaun, thanks for asking! If you have the latest version it should not break anything. code though, so I can’t be 100% sure. I am not able to order details. Can you please guide me? I’m not sure I understand what you mean. Can you explain? Are you wondering why working for Automattic is cool?